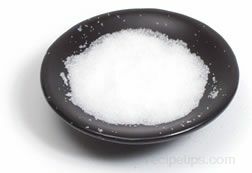 A fine-grained salt that does not contain iodine or other additives, that is used in the process to pickle meats and can foods. This salt prevents the brine from becoming cloudy as the food is prepared to be pickled or canned. Canning salt is also referred to as pickling salt and is a seasoning that can be easily found in all supermarkets.